Zlimline Cavi is designed to reshape and sculpt the body and remove localised stubborn fat or cellulite. Revolutionary ultrasound cavitation treatments leading to gradual reduction in stubborn deposits of fat and unsightly cellulite. Many people see instant reduction of circa 10-15 cm³ from the very first cavitation session. Cavitation procedures are suitable for both women and men. Cavitation is body shaping, sculpting and modelling through application of low frequency ultrasound, which means that cavitation is a non surgical alternative to liposuction. Cavitation is a fatty tissues reduction process that does not leave scarring, does not cause any major discomfort or requires recovery down time. Most of all, cavitation does not require general or local anaesthesia. Zlimline Cavi uses ultrasound frequency of 40 KHz and the sound waves generated by the device penetrate 2,5-8 cm of the fatty layer. During cavitation, low frequency ultrasound waves are transmitted to your fatty tissues through the skin using ultrasonic cavitation handle. The ultrasonic waves penetrate the fatty cells, creating micro bubbles in liquidised fat. The bubbles grow and implode, breaking the fatty cells up. This process only happens in the fatty cells, leaving other tissues, such as nerves, muscles and skin unharmed. Liquefied fat from broken up fatty cells is metabolised to simple free fatty acids and glycerol, which as subsequently eliminated from the body via the lymphatic system or metabolised by the liver and expelled with other waste substances in urine. In addition to breaking up fatty cells and cellulite, ultrasound cavitation also improves blood circulation, lymphatic circulation, metabolism, skin texture and tightens the skin. Many people see instant reduction of ca 3–4 cm from the very first cavitation session. Others see progress only after the 3rd or 4th session with some people experiencing up to 8–10 cm reduction per session. Such different responses are due to the differences in fat density. Some fat is watery and easy to reduce and remove. When fatty cells are packet tightly together, the first cavitation sessions serve to gradually soften and loosen the densely packed fatty mass, slowly breaking up the fatty cells and gradually eroding the fatty layers. It is important that you help your body to utilize the effects of cavitation by helping your body to remove fatty waste naturally. You can do this by following the post cavitation advice to exercise, keep to low fat diet and drinking sufficient water to flush out the fatty waste from your body. Zlimline Cavi leaves no scars and has no recovery down time. Cavitation can help you re-shape your body, reducing stubborn localised fat and cellulite in the areas difficult to deal with just with exercise and diet. Used for cavitation self treatments at home, Zlimline Cavi helps you achieve a leaner, fitter and attractively shaped and sculptured body. You can target body areas well known for accumulation of fatty layers and cellulite, such as tummy, flanks, buttocks, upper arms and inner and outer thighs. Zlimline Cavi puts you in charge of your own body shaping and sculpting! 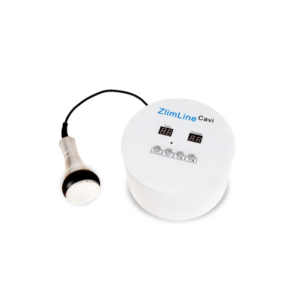 Zlimline Cavi is light, portable and easy to use. Yet it features powerful commercial grade Cavitation handle (Ultrasound Probe) operating at 40 kHz cavitation frequency that blasts away stubborn fatty deposits and unsightly cellulite. One treatment takes between 20–40 minutes, depending on area you treat. To ensure precise monitoring of cavitation effectiveness, measure yourself accurately before each session. User manual gives you directions on how to perform correct measurements of different body areas (i.e. abdomen, arms or legs). Once you have selected treated area and measured yourself, ensure that you spread cooling ultrasonic gel over the area to be treated. We will send one free 5L litres ultrasonic gel with every Zlimline Cavi unit. One treatment takes about 40 ml gel. It is best to leave at least 72 hours between treatments to allow plenty of time for your body to eliminate the fat after the single treatment. The above frequency of treatments recommendations are just for your guidance. Best outcomes are normally achieved with 6 to 12 treatments per area. However, it depends how much body shaping and contouring you need and how dense are your localised fatty areas. Some fat is watery and requires fewer treatments than firm and hard fatty layers. Most people notice instant loss from the very first treatment and others experience inch loss after subsequent treatments.